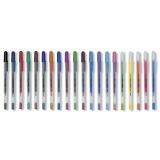 Gelly Roll Fine Point Pen - SAKURA-Gelly Roll Fine Point Pen. 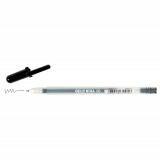 The gel ink flows through this rollerball with a creamy, smooth consistency which results in extraordinary writing comfort! Ink is archival quality, waterproof, fade resistant, and will not bleed through most papers. This package contains one .6mm gel pen. Available in a variety of colors, each sold separately. Imported.